Flower: .6 in. (1.6 cm.) wide inconspicuous four-petaled white flower that grows in the center of each rosette. Leaves: 0.75 - 1.5 in. (2  4 cm.) long toothed leaves, shaped as a floating rosette. The leaves are wider at the base and narrow into a point at the top. There are also submerged lower leaves which are 6 in. (15 cm.) long. Plant: Rooted, floating, aquatic plant that forms dense mats on the water's surface. Identifying Characteristics: There are no other water plants similar to European Waterchestnut. Location: We found European Waterchestnut on the Brandeis University campus in Yakus pond, next to the Sherman dining hall. History and Comments: European Waterchestnut is native to Eurasia, and it now grows in the Northeastern United States. It is highly invasive, and a major effort is underway to prevent its spread to the Midwest. Ironically, a gardener intentionally planted it in Cambridge, Massachusetts and in Concord, Massachusetts around 1850. By 1879, it was reported as being highly invasive. It forms dense mats which choke out native vegetation, and because it contains fewer nutrients than native plants, it is harmful to pond life. European Waterchestnut also has a thorny fruit, which is painful for humans and animals if stepped upon. 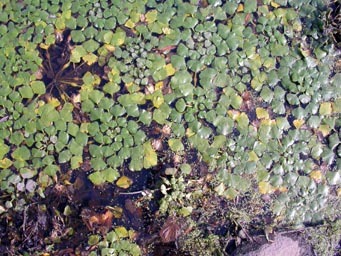 For more information on European Waterchestnut, click http://webapps.lib.uconn.edu/ipane/browsing.cfm?descriptionid=25. Unless otherwise specified, all text, photographs, and drawings are Copyright (c) by Shu-Yee Chen and Deborah Hamer 2003. No part of this page may be reproduced without prior written consent of the authors.